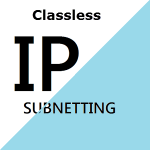 Let’s dig into Understanding Classless Subnetting Concept. 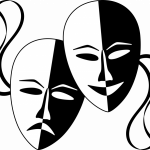 In my previous article Understanding Classless Subnet Mask, I have explained briefly why in the 90’s a new approach to distribute the IP Space Classless Subnet Masks was required to replace Classful Masks. In this article, I am going to dig deep into this approach for Subnetting (dividing) the Classful Networks into smaller Subnets. As mentioned, Classful A Networks use 255.0.0.0 Netmask, but it can uses Classful B Netmask 255.255.0.0, or Classful C default Netmask 255.255.255.0, however, it’s important to remember that default Classful Masking Rule is by Byte base, yet the Classless Subnetting Rule is by Bit base. Let me show you what I mean. The following Subnet Masking technique based on moving the Network place value bit by bit at a time. You will notice how I started with the first subnet mask then little by little start moving bit at a time, up to the last possible Subnet Mask. Focusing on the 2nd byte 1000000, draw the Binary chart and plug the 2nd byte starting from the right. Once the first bit at the second byte turned ON, the byte get divided by 2, meaning, 256 / 2 = 128. Another way of saying: because the 1st bit on the 2nd byte represents the main origin of the Network, then you have created 2 Subnets. The following draw shows how the 255.0.0.0 had all the hosts bits under One Network, and how later on the 255.128.0.0 divided the Hosts bits to 2 Subnets. As you can see from the above image, the 1st bit on the second Byte from the left was turned ON which have divided the Classful Network to 2 subnets. The following layout is for Private Network 10.0.0.0 with prefix/9. It shows how prefix /9 divided the Network to 2 Subnet IDs with 2 Broadcast Addresses. Remember, dividing the Network to Subnets, creates Multiple Networks (called Subnet IDs), and more than one Broadcast Address. Subnet ID 128: 10.128.0.0/9 with broadcast of 10.255.255.255. And since Cisco Recommends No more than 510 IP Addresses per Subnet, prefix /9 is not practical to use neither in Public nor in private. It provides more than 510 usable IP addresses, and it would be impossible to be used by ISP for Public use, since it lease massive number of IP addresses which more than the Business needs or any Router needs. You need smaller blocks of IP range such 510, 254, 128, 64 and 32, these blocks of IP range are mostly used by private Networks inside the company, ISP on the other hand, which is the Public side of our Internet, should release smaller Blocks such 16, 8, 4, and 2 for most businesses. TIP: Network Address Translation (NAT) for home and business use, played big role in saving the IPv4 Space, it can share one Public IP Address among hundreds and thousands of computers. Besides, business can use Variable Length Subnet Masks (VLSM) as well before using the Public Block of IP Addresses if needed. VLSM simply means Sub-Subnetting. I will continue Subnetting Network 10.0.0.0 but without laying out the usable IP Address range of each subnet due to space reason, however, the importance of the following examples is to show you what’s happening at the Binary level. Using 255.192.0.0 prefix /10 will divide Network 10.0.0.0 for 4 Subnets. Using 255.224.0.0 prefix /11 will divide Network 10.0.0.0 for 8 Subnets. Using 255.240.0.0 prefix /12 will divide Network 10.0.0.0 for 16 Subnets. Using 255.248.0.0 prefix /13 will divide Network 10.0.0.0 for 32 Subnets. Using 255.252.0.0 prefix /14 will divide Network 10.0.0.0 for 64 Subnets. Using 255.254.0.0 prefix /15 will divide Network 10.0.0.0 for 128 Subnets. Using 255.255.0.0 prefix /16 will divide Network 10.0.0.0 for 256 Subnets. And so on…then the Subnet Mask will continue on the third byte as follows: 255.255.128.0… 255.255.254.0, up to 255.255.255.0, and jumps on the 4th Byte as follows: 255.255.255.128… up to the last possible Subnet Mask 255.255.255.252. 252 at the last Byte a.k.a prefix /30, will give you 2 usable IP Addresses suitable for WAN connection between 2 Routers. So, If you use Subnet Mask 255.192.0.0 (which is 128+64=192) then we divided the Network to 4 subnets instead of One big Classful Network, simply because there are 4 64s inside 256, notice how the 256 is a center or the origin. Note: Always the last Subnet bit determines the division of the Network, which is the Increment Number. Notice how the Subnet bit at place 64 tells us that 256 holds 4 64s places, hence, 4 Subnets! You probably heard of Magic number or Interesting number, it simply says: where ever you choose to stop your Subnet Bit moves, then its place value become the Increment Number of all Subnets. Let’s say you have one pie of Pizza, and you have decided to divide it using a Quart measurement such a 25% measurement, therefore, this measurement will divide the Pizza Pie for 4 Pieces! 25% is your measurement base, and if you used Subnet Mask 255.192.0.0 with any Classful A Network, then (25%) or 64 place will be your Subnet Base, which will give you 4 Subnets inside the 256 Pie! You start from 128, 192, 224, 240, 248, 252, 254 …up to 255, then again, but this time at the 3rd Byte: 128, 192, 224, 240, 248, 252, 254, up to 255, then again on the 4th Byte: 128, 192, 224, 240, 248, and up to only 252 on the last Byte. Notice, that you can’t go more than 252 on the last 4th Byte, simply because you have to have 4 Zeros places left. One for the Subnet ID, the second one for the Broadcast Address, and the last 2 Zeros in the middle as usable 2 IP Addresses. So, with the last Byte using 32-bit IPv4 Networks, the last subnet Mask that can be used is: 255.255.255.252 or prefix /30. A Classful private A Network 10.0.0.0 that uses a default Mask 255.0.0.0 got static number in terms of Network and IP Addresses, which is One Big Network, and Massive number of usable IP addresses. However, using Subnet Mask instead such 255.254.0.0 with Network private 10.0.0.0, you have switched from Static to Dynamic mode by moving the Subnet Bit 7 extra places to the right, hence, divided the Static One Big Network to 128 Subnets (27 = 128). Each Subnet got its own IP addresses range. 28 = 256 Subnets, meaning, divided the Network 10.0.0.0 to 256 Subnets. As mentioned, the Moment you start moving the Subnet bit to the right, it becomes Classless A Subnet. So, moving it 15 Places would give you 215 = 32,768 Subnets. Notice how the Host bits are less by now. To calculate the Hosts 29 = 512 – 2 = 510 usable IP Addresses. And if you move the subnet bit 16 places, then you wand up with at 255.255.255.0 Subnet Mask which gives you 28 = 256 – 2 = 254 Usable IP Addresses and 216 = 65,536 Subnets. Each carries 254 IP Addresses. So, a Classful A Network such 10.0.0.0 with prefix 8, carries millions of IP addresses. In order to reduce its Big IP Space from millions to 510 or 254 IP addresses per subnet, you need to decrease the Host bit places by moving the Network bit places as needed to right. Private 172.16.0.0 Network using prefix /16 would be only one network which with only one IP Range, besides, there will be no Increment since no Subnetting has been defined. TIP: At Class B, the Subnet bit starts at the 3rd byte. Besides, private B Networks can use prefix /17 up to prefix /30. Notice the last Subnet bit which is the Increment number, it dictates Subnet Numbers, hence, IP Range in each Subnet. Our last bit on the third Byte is: 32, therefore, 172.16.0.0 is Subnet Zero, 172.16.32.0 is Subnet 32, 172.16.64.0 is Subnet 64, and so on, the increment is 32. 172.16.0.0/16 Network has been divided to 8 subnets each carries 8,190 usable IP addresses. Using prefix /19, then you have left with 13 bits for the Hosts (32 – 19 = 13), therefore, 213 – 2 = 8190 Hosts per Subnet, but that’s not practical to have such number of hosts per subnet, however, it’s good to practice different prefixes. As recommended by Cisco and has been proven by the real world as well, that the maximum number you should have on each Subnet is: 510 usable IP Addresses. If you can make it 254 would be better, the lowest the better to lower Broadcast messages effect. The first subnet would be subnet ID Zero 172.16.0.0, and since 32 is the increment number, the second subnet would be 172.16.32.0, and so on. 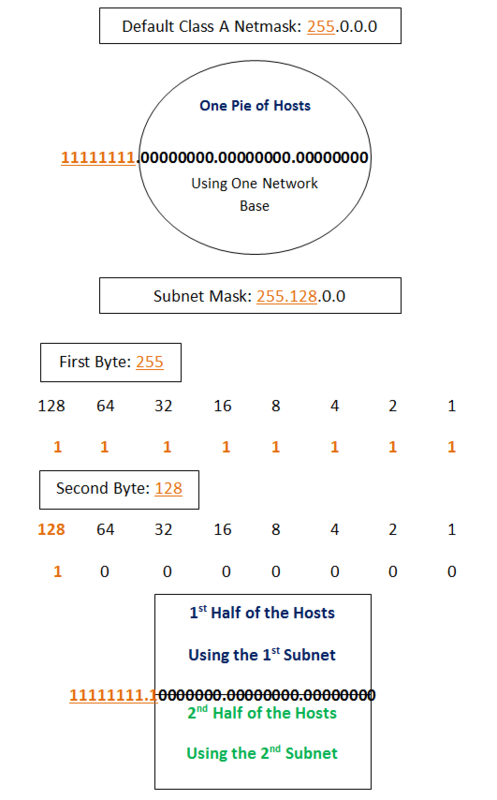 Once again, notice how the last Subnet bit located at the third byte (which its place value is falls under 2) always dictates Subnet Numbers and IP Range in each Subnet. Our last bit’s value on the third Byte is: 2, therefore, 256 / 2 = 128 Subnets. 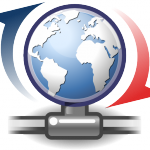 The Network has been divided to 128 subnets each carries 510 usable IP addresses. More practical prefix for all Classful Private Networks would be prefix /24. Our last bit on the third Byte is: 1, therefore, 256 / 1 = 256 Subnets. The Network has been divided to 256 subnets each carries 254 usable IP addresses. On the Public side, ISP provider leases you a Subnetted Block of IP addresses if you have business account, you might have the choice to Sub-subnet that block for smaller Subnetworks in order to utilize the block in an efficient way. Sub-Subnetting public IP Address space gives you the opportunity to assign public IP Address for more than one Network device, that is Variable Length Subnet Mask which I will talk about at the next articles as small letter s = Sub-Subnet! On the private side, Subnetting Private Networks will easy the management of your company Network needs. A company that might have 50 branches around the world, must have 50 subnets in their Domain Controller, therefore, Subnetting your Internal Private IP space is a must to control the Network of all your company branches. Class A Networks give you the most amount of Subnets when you use Classless Subnets, and since it’s origin Mask start with far on the Left as 255.0.0.0, you have 3 Bytes free for Subnetting, Class B Networks got 2 Bytes for Subnetting, and finally Class C got Only one Byte for Subnetting. By Wikipedia Subnetwork | Router Ally IPv4 | HighTech IPv4 Addressing | The TCP IP Guide | Cisco CCNA Simplified | Cisco CCNA in 60 Days | CCNA R&S Certification Kit | Subnetting Made Easy | Who is Running the Internet | IP Addressing and Subnetting | The Only IP Book You Will Ever Need!